In April 2012 we reported the keel laying for the 43.9m motor yacht Green Voyager at Kingship Marine and now I learn she’s on the market with Simon Goldsworthy and Fernando Nicholson at Camper & Nicholsons. Under construction at the yard in Zhongshan, China, Green Voyager is one of the first hybrid ‘green’ superyachts under 50m. Respecting multiple rules and regulations, she has a low impact on the environment, without compromising on luxury and comfort. Built in steel and aluminium, this 43.9m superyacht is designed by Axis Group Yacht Design with an interior by the shipyard’s in-house team. Powered by twin C32 ACERT Caterpillar engines, she will have a top speed of 16 knots and a cruising speed of 13.5 knots. Using an innovative power management system, the requirement for generators is only 2x 65kW versus the standard 100kW used on a yacht of her size, resulting in even further fuel savings. Green Voyager features a five stateroom layout which extends living spaces to the exterior with full height windows and folding platforms which create lateral sea terraces. The ocean is further enjoyed with large open deck spaces on the sun deck, bridge and main decks forward and aft. 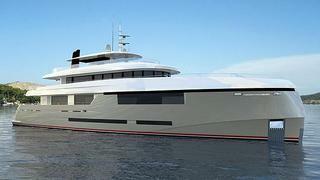 Scheduled for delivery in 2014, Green Voyager is asking €14.8 million.